Two UKIP officials have resigned from the party, claiming leader Paul Nuttall was "unprofessional" and donor Arron Banks showed "crass insensitivity" about the Hillsborough disaster. 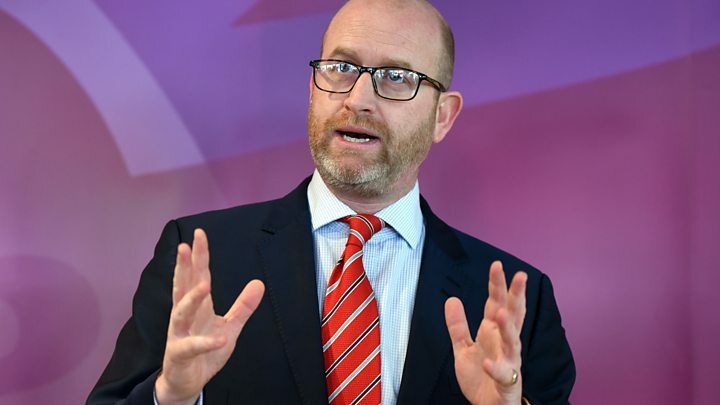 Mr Nuttall said last week he was "sorry" over false claims that he had lost close friends in the 1989 tragedy. Mr Banks later tweeted he was "sick to death" of hearing about Hillsborough. Liverpool and Merseyside chairmen Stuart Monkham and Adam Heatherington said such comments were "intolerable". Mr Nuttall is yet to respond while Mr Banks has declined to comment. Ninety-six fans died after the crush at the FA Cup semi final between Liverpool and Nottingham Forest at Sheffield Wednesday's ground. He said he did not check press releases posted by an aide in 2011 and 2012. Relatives of Hillsborough victims accused the MEP of "insensitivity". Mr Heatherington said he "completely" endorsed Mr Nuttall as party leader and claimed most of the anger in Merseyside was directed at Mr Banks over the "total disregard" he had shown for the victims' families. He told BBC Radio 4's World At One programme: "It was the Arron Banks' remarks that I cannot put up with." Mr Heatherington said the party leader should have taken down the comments about losing close friends at Hillsborough from his website sooner. "That's where he was unprofessional, but he's apologised, it's been taken down. In a statement, Mr Monkham said: "Although the timing of our resignations is unfortunate in light of upcoming elections, both Adam and I wish to make it clear, where the painful subject of Hillsborough is concerned, with closure not yet in sight, this unprofessional approach and crass insensitivity from high profile people closely within and without UKIP is upsetting and intolerable." He said they had been "affected both personally and professionally by words that were not said in our name". "With this in mind, we wish to apologise to the people of Liverpool and the Hillsborough families for any offence caused and have done what we consider to be the only honourable thing we could do which was to resign and disassociate ourselves from UKIP." Mr Monkham added that he "felt that supporting a libertarian party was the right thing to do in order to effect change within the political system in this country". "Unfortunately that dream has been shattered and the potential of UKIP has been squandered by people who have demonstrated they are not fit to lead at present." The BBC's assistant political editor Norman Smith said UKIP officials in Merseyside were expecting further resignations in protest at Mr Nuttall's handling of the Hillsborough controversy. Mr Nuttall, who is an MEP for North West England, is a candidate in the Stoke Central by-election, which is being held on Thursday.